great food Maine has to offer with the best seafood and lobster interpretations that will please the most sophisticated pallets. 7 days a week from Memorial Day Weekend to Labor Day Weekend. We are open Daily for Breakfast 7:30 AM to 2:00 PM and Lunch from 11:00am to 5:00 PM Dinner is 7 Days a week from 5:00 PM to 9:00 PM Breakfast and Lunch are walk-in only. Our recent renovations allow us to provide beautiful function space for your parties, business meetings, weddings, rehearsal dinners or any business or social occasion. Looking forward to their scallops but they were out of them. Waiter didn't inform us until he came to take our order. Disappointed but chose something else which he modified to my dietary concerns. It was very good. Always have a good meal there but they have a limited menu. Food was very good in a nice setting but the service was quite slow and there was a long wait between courses. Extremely slow service, waitress very cold and unfriendly, many items listed on the menu they didn't have! Great disappointment! Insult to injury 20% service included in the bill! We were a little disappointed in the food. The paella was soggy and the ingredients retained little of their original flavor. The shrimp did not seem fresh. The blueberry cobbler had crust that had little flavor and the blueberry filling was out of a can. Maybe this seems snobby but we eat at higher end restaurants and have had better. The Moscato was carbonated, who knew. Portion sizes inconsistent. Excellent flavor combination. If you want to pay for presentation, this restaurant is for you. Two of the three steaks were over cooked. We sent them back and could overhear the waiter town the chef that we said they were overcooked but he didn't think so. The other dishes were delicious. It was just was not a pleasant experience overall. While enjoying our "end of summer" weekend in Ogunquit, we were fortunate to have made the right decision to enjoy our special anniversary dinner at the Wild Blueberry. We thoroughly enjoyed the outstanding service, diverse menu with the freshest, quality ingredients from appetizers through to desserts. We'll certainly be back and will recommend to all family, friends and acquaintances. Fine food and fine service, with a live piano playing in the background - a pleasant, reasonably quiet spot for a relaxing meal. This location, menu and decor were very appealing and it drew us in. We were appalled at the service food and food delivery response time. The waitstaff had no idea what they were doing and I along with other patrons got up to complain about the service . Very unfortunate because it's a great spot , but will never dine here again ! Great ambiance but the food was below average and pricey. There are many choices in the area with excellent food. I would suggest grabbing a drink at the bar and maybe an appetizer. The soup was excellent (chowder) but main courses on all fronts were very average. Good service and beautiful restaurant. What a find. I passed this place many times but never went in. We loved our dining experience. Great ambiance, great food and bread basket, good service. Lobster avocado salad and paella were excellent. Food was delicious, service was slow. We sat outside which was lovely. Great food, location and ambience! However, service was quite slow due to minimal waitstaff In dining areas. This restaurant opened in 2006 if I am remembering correctly. Food was excellent, but it took awhile for people to notice the place in significant numbers. Business seems much better these days. The restaurant is open for breakfast and brunch, closes between 2-5 pm, and then reopens for dinner. A fairly wide variety of menu items are offered. Although seafood is emphasized, there are a sufficient number of non seafood options as well. Food is well-prepared and tasty. Service is friendly and efficient. Prices are what you would expect for a nice restaurant. 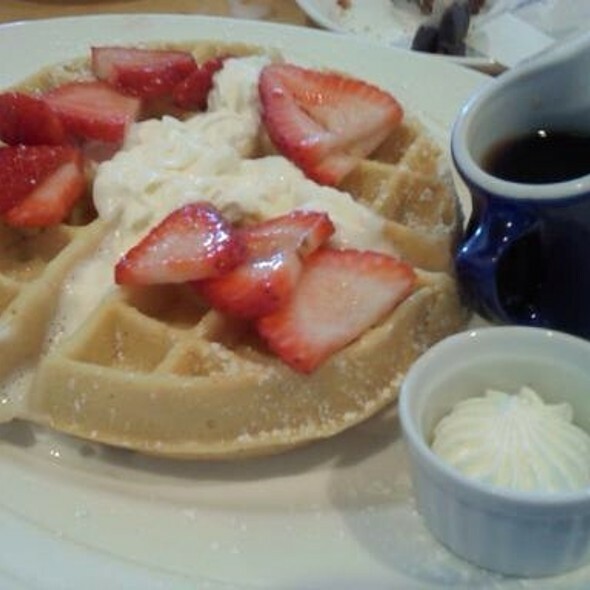 You can't go wrong eating breakfast, lunch or dinner at the Wild Blueberry Cafe in Ogunquit. The entrance to the Marginal Way is right across the street from this restaurant. Eat well and then walk off your meal along the beautiful Marginal Way. We were seated immediately but didn't see a server for at least 10 minutes. However, once the server came out experience was top notch. Chef came to the table and offered advice on dishes. Server was attentive and pleasant. Haddock was AMAZING! Great food and ambiance. Will most certainly return! I eat here every year when we go to Maine. The food and service are wonderful. I had Paella this time, and savored every bit of it. The staff is friendly and courteous. The chef came out to check on us. You can't ask for a nicer place to eat in Ogunquit. Our food was delicious. The portions were tiny and a salad with the meal would have been appreciated for the cost. They could not get my son's dinner right...they brought out 2 raw dishes. My wife's seafood dish was too fishy. The steak and mash was outstanding. Lobster was chewy. Food was wonderful as was the atmosphere. Will be back for another meal. We had 7:45 reservations for a party of 4 and the place was not that crowded. It took over 2 hours for dinner. We stopped here on out way to Rockport Maine to get the kids a quick dinner and finish our drive. The food was moderate at best, overpriced and the service was extremely slow. We won't be back. We tried this restaurant for the first time, and we were looking forward to a very special evening out, but ended with complete disappointment. The service was poor and inattentive. We had to asked for water three different times, with the acknowledgement that they would get it along with asking for the hostess to find our waitress so we could order another round of drinks all while waiting at least another 20 minutes just for our water to be filled. The appetizer of calamari was great, but the entrees were nothing to rave about. A steak that was ordered rare came out well done, and the lobster tail was complete rubber. Because of the initial over an hour wait for our entrees, we chose not to reorder that steak. After we declined the new steak, we came to find out our waitress had to told the kitchen that we did want another one, which was not true. Yes, we were comped the steak from our bill, but the overall dining experience was one of the worst I have ever had. It was not a busy night, though our own waitress and staff in general were hard to find and only came to our table when requested. I am sorry to see this happen as we are all from Ogunquit and my mother who joined us works at a local hotel in Ogunquit and will not be making any recommendations for this establishment. Tried this place for dinner, drinks ordered first, wine was good mixed drinks were so so. Then ordered two appetizers and dinners. 45 min later the apps came! One was lobster and avacotto salad which was good, the other gnocchi was terrible. After the appetizers it was again a long wait for the entries. The Paella ended up to be wet rice with seafood which seemed like it was heated in a microwave oven. The other entrie which was veal with polenta was uneatable . In the past we hav enjoyed good breakfast here but now we will never go back. The food and service was excellent. The prices were very good for high quality fresh food. We were visiting Ogunquit for the weekend and chose The Wild Blueberry because the menu looked enticing and the restaurant looked inviting from the street. It was a Friday night so we made reservations earlier in the day and I have to admit we were a little skeptical right away as there were only a few people in there when we arrived (7:30). Those thoughts were soon gone once the food started to arrive. I had the Spinach Salad and wifey had the Arugula Salad. Both were expertly presented, super-fresh and very very tasty. For dinner I could not resist trying the Paella, and my lady opted for two Tapas dishes--Paella and the Scallops. All were expertly prepared, hot and fresh. We don't normally worry about cost when dining at this type of restaurant but we were raving about the great value for these meals--Mine was $32 and well worth it considering the amount of seafood within, while the two Tapas dishes were $23 combined---a steal. After this, we had to try dessert so the logical choice was the Blueberry Cobbler. If they brought a whole pie we would have eaten it. Fresh Maine blueberries under a perfect crumb crust and piping hot. Wait staff was very accommodating and friendly. When we go back to Ogunquit next year, The Wild Blueberry will be at the top of our restaurant list. amazingly slow service, approx 20 minutes once seated for a waiter to even come over to say hello. Approx 50 minutes for food to arrive. Approx 30 minutes after plates cleared before we got our check and that was after we flagged the one and only waiter down. At this hour there were only a few tables left with patrons so not sure why the service was slow throughout. All the diners were talking to others about the extremely slow service. The Wild Blueberry is a restaurant with really good food. Breakfast and lunch menus deliver multiple choices and sumptuous flavors and tastes. Dinner, however, is a different story. Going from a great breakfast and lunch with casual flare, Wild Blueberry attempts to transform into an elegant, high-class restaurant. However, it misses on this attempt with uninformed or less-experienced servers and a quieted ambience. The food was flavorful and we'll presented. Particularly, the seafood paella delivered spirit and richness but was scarce on scallops (2), clams (2), and crab claws (2). The bowl was overflowing with muscles which also added to the frustration of working hard for a $32 plate when I should have spent more time enveloped in the paella. Our group had 4 different entrees and everyone was happy. Our service was excellent and patient as 3 in our group had multiple food allergies. The food was expertly prepared and presented nicely. Breakfast also was excellent. Best meal of the week! The only negative thing we have to say is a table of ten women were seated next to us and they were very loud, sorry to say it spoiled the perfect mood of the restaurant. We so enjoyed the piano player and the food was beyond delicious! We will be back next year! An terrific restaurant. The haddock was the best we had in Maine. The restaurant has a nice atmosphere and is quiet. Service was excellent. We have enjoyed the food presentation, the blend of textures and aromas. A different way to explore new taste. The wine suggested to pair our choices was superb. A good discovery for us! 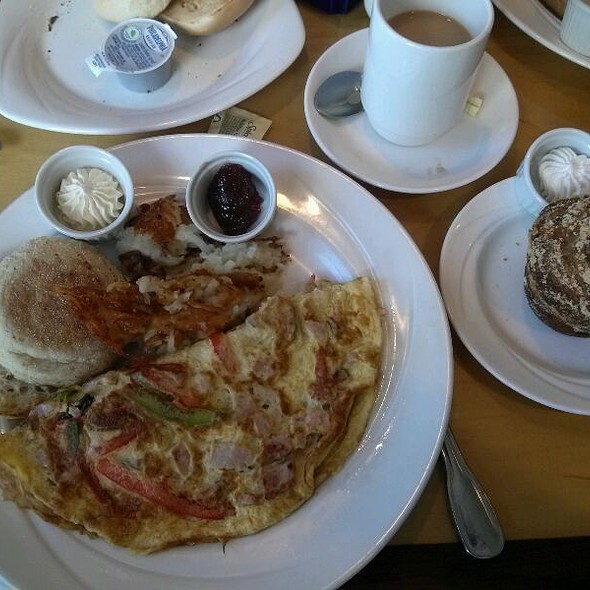 The best breakfast in ogunquit. Great food, wonderful service, very nice atmosphere.